Israeli soldiers abducted, on Sunday at dawn, eight Palestinians from the West Bank governorates of Bethlehem, Nablus and Jerusalem,the Palestinian Prisoners Society (PPS) has reported. 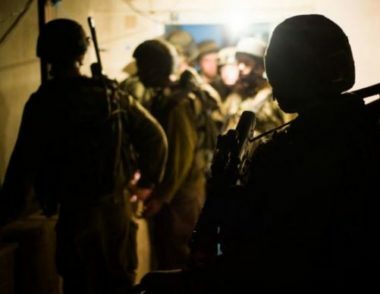 The PPS stated that the soldiers invaded and violently searched many homes in the three governorates of the occupied West Bank, and interrogated several Palestinians while inspecting their ID cards, in addition to installing roadblocks. The PPS office in Nablus, in northern West Bank, said the soldiers abducted Salama Marwan Abdul-Jawad, Mohammad Zaki Ebdah, Jamil Salaheddin al-Aqra’ and Bara’ Kamal Hashash. In Bethlehem, the soldiers abducted Rani Hani Bisharat and Mahmoud Adel Zboun. Furthermore, the soldiers abducted a child, identified as Ahmad Eyad Shalabi, in addition to Mahdi Jaber, from their homes in occupied East Jerusalem. The abducted Palestinians were cuffed and blindfolded, before the soldiers moved them to a number of detention and interrogation centers.